Sony's new line of ultra portable notebooks, the VAIO Z series includes the new model, Sony VAIO VGN-Z591U/B. The Sony VAIO VGN-Z591U/B only weighs a little bit over 3 pounds and features a 13.1 inch widescreen display. A seamless, brushed aluminum finish frames the keyboard and the unit is housed in a carbon-fiber casing that protects it from shock and bumps when traveling. Sony designed the keyboard of the VAIO VGN-Z591U/B so that even though it is small, you won't feel cramped when typing. 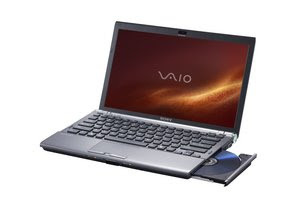 The Sony VAIO VGN-Z591U/B features an Intel Core 2 Duo 2.53 GHz processor plus a 4GB DDR3 RAM. This notebook has a 320GB hard disk drive with 5400rpm speed and Serial ATA connection. The hard drive is also equipped with a G-Sensor shock protection so that your precious data won't get corrupted while traveling. Connectivity options is abundant on the Sony VAIO VGN-Z591U/B. It has an integrated Mobile broadband technology powered by Sprint, WiFi and the latest stereo A2DP Bluetooth technology. You might also want to opt for a Blu-ray optica drive since the Sony VAIO VGN-Z591U/B has an integrated HDMI output so it's like having a portable Blu-ray player. It also has an integrated NVIDIA GeFOrce 9300M GS with 256MB RAM graphics card. Sure, ASUS is making waves with their EEE PC but the Sony VAIO VGN-Z591U/B is on a class of its own. This is defnitely for the high end market.